When it was time to retire our 29 gallon aquarium, we went back and forth with getting a 55 gallon or a 75 gallon tank. I personally wanted to go as big as the space at our house would allow. But I wasn’t sure we’re up for the commitment of having a huge tank and so much more fish. Eventually, we settled on getting a 55 gallon aquarium. 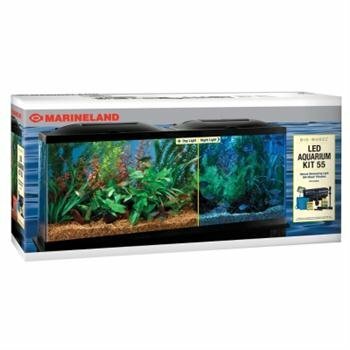 Specifically, we bought a 55 gallon Marineland (Aquaria) AMLPFK55B Biowheel Aquarium Kit with LED light. Dimension: 50.5 x 15 x 23.5 inches. 3 position switches – on, blue and off. LED aquarium light integrates securely into place even when hood is open. Unpacking and setting up the tank is easy. We got everything done in under an hour. Everything it came with is made of plastic – hood, filter, trim parts. The biowheel filter holds a double filter with an adjustable intake. I like how the whole filter system is quieter than what we used to have. The LED lights are basically just 2 LED panels that go on each side of the split hood. They are removable and came with detachable power cords. They provide a nice shimmer effect to the aquarium. Unfortunately, I don’t think they have enough light energy to make my plants grow. So I had to make adjustments and get a different set of LED lights. The three-way manual switch is nice, but it would have been nicer to have a timer in there. I liked how for the price I get a lot of stuff to go with it. Not many brands do. I still have some equipment from our old aquarium so it wasn’t really any trouble or was it absolutely necessary. But we figured the price is enough of a bargain and it’s always nice to have new equipment. The thermometer it came with seems ok. The startup pack came with some fish flakes, a net and some water conditioner. Don’t expect too much. The net isn’t long enough to reach the bottom of the pool and the water conditioner really isn’t a lot. I had to wet my arms up to my elbows just to reach the bottom of the tank. The thermometer sticker peeled off easily, too. However, I am mostly happy with this aquarium. It’s holding out rather well. Other than the peeling thermometer sticker, nothing has broken or fallen apart and we have been using this for almost a year now. I did buy a few replacements (like the LED lights), but those worked just fine with the rest of the system setup. I did have a minor issue with the LED lights flickering. But we traced it back to the power adapter. I replaced that with a different one and everything worked out fine again. No more flickering lights. Lights that come with the package cannot support plant growth. Light is manual, no timer. Thermometer stickers tend to peel off.